Daniel Ussishkin. 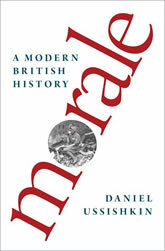 Morale: A Modern British History. Oxford University Press, 2017. In this first critical history of morale, Daniel Ussishkin asks how is it that modern Britons have come to regard morale as a category of conduct, vital for the success of collective effort in war and peace, and a mark of good, modern, and human managerial practice, appropriate for a democratic age. He narrates the intellectual, cultural, and institutional history of morale in modern imperial Britain: its emergence as a new concept during the long nineteenth century, its changing meanings and significations, and the social and political goals those who discussed, observed, or managed morale sought to achieve. Formalized as a new military disciplinary problem during the long nineteenth century, morale came to permeate nearly every civilian sphere of life during the era of the two world wars as a new way of managing human conduct. This book traces how it gradually emerged from a problem that was regarded as residual at best to one that was seen as the epitome of proper managerial practice, its institutional manifestations and promotion by myriad organizations and the social-democratic state, and its emergence as a potent political concept from Britain’s social-democratic moment until the ascendancy of the New Right. Daniel Ussishkin’s Morale tells the history of concept central to the management of war, business, and civic society not just in Britain but in modern culture writ large.